The Cibolo Nature Center and Farm is celebrating its 30th year of service to our community! Click HERE to see the list of our many milestones along the way. We are a community that passionately believes our brightest future is one lived in harmony with nature. Beginning with the Cibolo Creek, our aim is to ensure our natural treasures are not only protected, but thriving. To do this, we’re building a unique conservation model to protect our resources, study and learn from the natural world, teach and apply sustainable farming practices, and encourage the enjoyment and celebration of nature. We believe that our model is teachable and that our successes in the Cibolo Creek can be replicated in conservation efforts across the globe. In 1988, Carolyn Chipman Evans, her husband, Brent Evans, and a handful of friends dreamed of protecting a segment of the precious Cibolo Creek in Boerne, Texas and the land around it as a wildlife preserve where families could enjoy and appreciate nature. 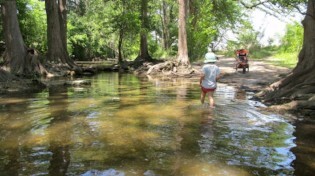 Carolyn approached the City of Boerne to urge the restoration of disappearing marshland and the creation of nature trails on 100 acres of the existing Boerne City Park adjacent to the creek. The city's cooperation, and Carolyn's enthusiasm, brought a rebirth to the land and a renaissance of public concern for conservation of Boerne's natural resources. Open to the public since Earth Day 1990, the Cibolo Nature Center & Farm today is a prime example of community caring. Thanks to thousands of volunteers' dedicated work, the community is preserving its natural heritage for future generations. The Cibolo Nature Center & Farm is located on what once was the Herff Ranch, established in 1852 by pioneer surgeon Dr. Ferdinand Herff. 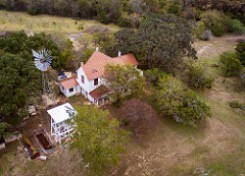 Much of the original 10,000-acre ranch has been developed, but the Friends of the Cibolo Wilderness group was able to acquire 62 acres of historic farmland across Cibolo Creek from the CNC’s nature preserve, including the original ranch homestead, which has been restored to National Register of Historic Places standards and is permanently protected through a voluntary conservation easement. A new resource for the CNC&F’s educational programs, the Herff Farm at the Cibolo offers workshops and programs to teach families simple techniques for sustainable living – including an organic demonstration Inspiration Garden – and is home to the CNC&F’s Farmers Market at the Cibolo, open from March to December. 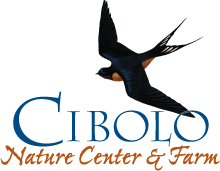 The Cibolo Nature Center & Farm now provides nature-focused education, research, entertainment and outdoor activities for more than 100,000 visitors a year, while promoting sound stewardship of land, water and wildlife. The Friends of the Cibolo Wilderness, a 501(c)3 non-profit organization that oversees the Cibolo Nature Center & Farm (called the CNC&F for short), began as a handful of friends working to make a dream a reality. It has evolved into a grassroots organization of individuals and partners committed to the value of hands-on nature education and conservation of natural resources, supported by the generosity of donors.